The area around Dalyan has some of the widest variety of wildlife to be found in Turkey, including some species of birds not found elsewhere in the world. A short tranquil boat ride away from Dalyan harbour is a four kilometer long beach that is home to the rare Caretta Caretta turtles. With the views, history, culture, wildlife, water and sea topped off by the warm local hospitality, Dalyan is a bautiful holiday destination. The ancient city of Caunos stands midway along the channel facing Dalyan. Settlement here is believed to date from 3000 BC by Caunos, the son of Miletos and it later grew into a major port on the border between Lycia and Caria. Sprawling over a broad sloping site overlooking the sea and the delta, the principal monuments to be seen in Caunos are the Acropolis surrounded by city walls, a theatre, four temples, an agora, stoa, nymphain, baths, palestra, churches and a cistern. The imposing Lycian rock tombs with their facades curved into the form of temples were the last resting place of the kings of Caunos. The city had two harbours, one for military use and the other for merchants. Inscriptions discovered on the nymphain have been found to cite customs regulations and have thrown valuable light on the economic life of the city. 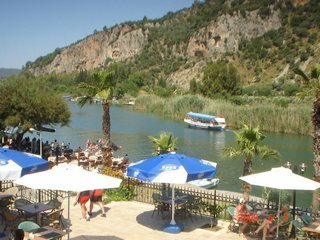 The Dalyan Channel, through which water circulates between the Mediterranean and Köycegiz Lake slowly meanders, forming a network of small lakes and waterways through reed beds rising to between 3 and 5 metres in height. (The journey through this natural labyrinth is romantic and mysterious) With its mixture of fresh and salt water, these wetlands have become home to vast numbers of fish and other water life, as well as the birds of many species which feed on them. Dividing the sea from the delta is the Iztuzu sandbar stretching for 5km east from the mouth of the channel. With its fine crystal sand, shallow turquoise sea and abundant sunshine, Iztuzu beach is the ideal seaside spot, perfect for swimming for 7 months of the year. It is this beach to which the endangered Mediterranean turtle Caretta Caretta has returned year after year to lay its eggs since time immemorial. Located right on the Dalyan River, the hotel looks across to old Lycian rock tombs which are illuminated at night. The hotel is family run and the owners are simply wonderful. 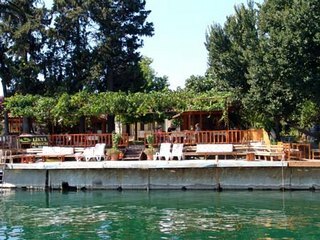 There is a beautiful garden/terrace overlooking the water and some ruins. The rooms are clean and spacious. Dalyan Tezcan Hotel ,a brand new hotel, is constructed in 2008 and ready for its elite guests with 46 luxury rooms. The Eye of history lies ahead; famous 'Rock Tombs' that stand still for centuries. 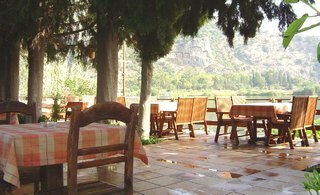 The pension faces Dalyan Canal and the Rock Tombs . The Canal, hidden behind the reeds, forms a very peaceful atmosphere and a unique beauty. The only sound that could be heard within that quietness is of the boats and this is a great pleasure.